"It is to be understood that we have already provided ourselves with a condensed chart representing the 3,000 years of history, during which the stream, which has now become the river of modern history, may be traced with some degree of definiteness towards its earliest sources. Such a chart might easily be condensed to such an extent as to be made conveniently visible as a whole, say within the compass of at most a yard in length. On such a scale periods of ten years can be distinctly differentiated, while definite years may be clearly distinguished when necessary by the addition of one or two numerals. 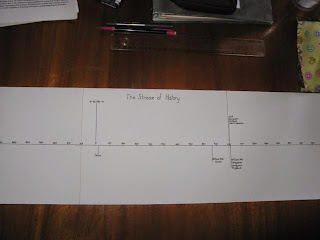 The facts recorded should be few, selected with care--key facts to the history of the time in which they occur, selected also in a catholic spirit, to represent, without bias, the real historical weight of the various political forces, which, in order to serve their purpose of historical landmarks, should already, before being introduced upon the chart, have been made thoroughly familiar to the pupil. The duration of dynasties, prolonged wars, social and religious movements, &c., might be made visible by the use of continuous lines, which will prove of great value in linking together successive events." 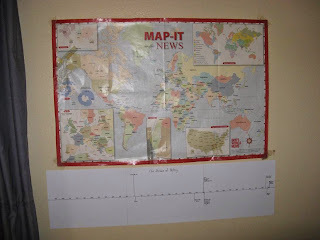 I taped together three pieces of cardstock end-to-end, and carefully ruled a line across the center. 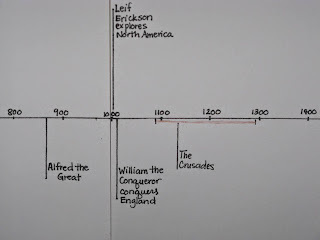 I marked off one inch for each century, which allowed me to include from 1000 BC to the present day. We won't study ancient history in depth until Year 6, so I'm not terribly concerned about not having a space to add dates prior to 1000 BC right now. I added in a couple of key points of reference – the life of Jesus in relation to the BC/AD dividing line, and the birthdates of my children in the early 2000's, my husband and I in the 1970's, and the children's grandparents in the late 1940's and early 1950's. 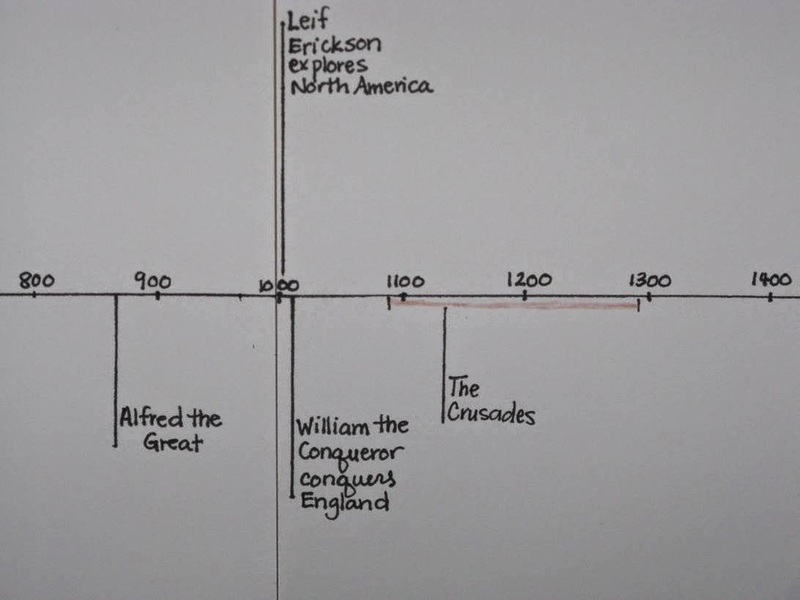 I also went ahead and added in some of the key events that we have studied already in this first term of Year 2: Alfred the Great, Leif Erickson, William the Conqueror, The Crusades. We will continue to add other key events as we come to them. I had a hard time imagining how just the MAJOR events could fit on a timeline this small, but adding only 3-5 events each term shouldn't overcrowd it, I hope. It actually might be a really good exercise for us to decide just what those key events and key people ought to be at the end of the term. Has anyone else constructed a compact history chart like this? I'd love to see it if you have! Very nice, Jen. Thanks for sharing! I'm going to link this post to the thread I began on the forum. PS - I left 3 comments on your last post on Masterly Inactivity and not a single one showed up - even though I am getting notifications in my mailbox to follow-up comments. Strange, so I thought I'd share. The gist of it was that I LOVED that post and am bookmarking it for future reference - particularly to share with those who maybe don't grasp the concept fully. Another comment was for Lisa thanking her for her beautiful thoughts on the role of prayer. I saw that post too. I'm toying with the idea of making something like that when we are back in the States next year and I can get the kind of supplies and frames that I would want for something meant to be that permanent. That kind of a 'child's own life' chart was a new idea to me when I read The Living Page too. I just received my copy of The Living Page this past week. I've read all the way up through the first couple of pages of chapter two. I look forward to reading the rest of the book! I like how you've done the timeline. I will most likely have to do ours in a binder as a fold-out. I'm thinking maybe I can do like you did by taping cardstock together; but then just fold it up at the seams so it can fit into the binder. I don't know if that is going to work or not though. I may have to use just regular copy paper. 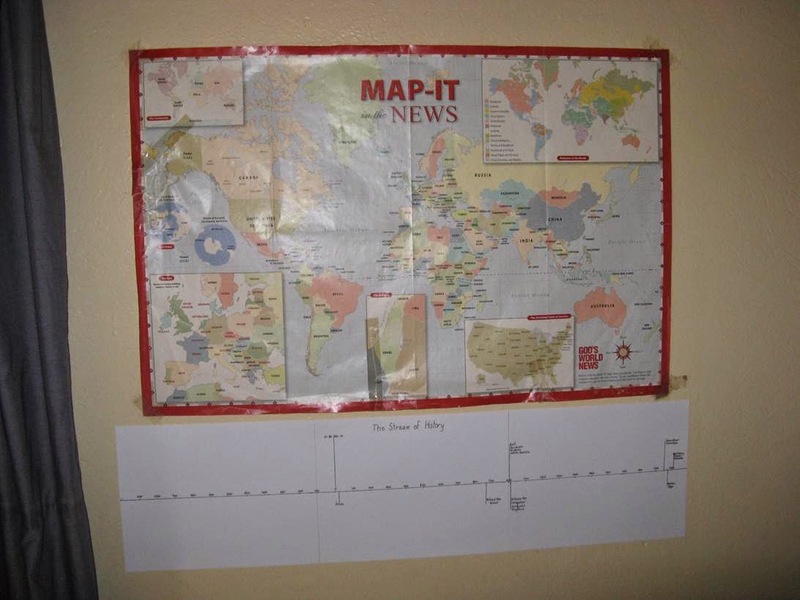 I love this on the wall...we have tried time lines in the past but they always end up stuck in a drawer or lost! Excellent thoughts on timelines & Book of Centuries. Thank you for sharing your experiences.